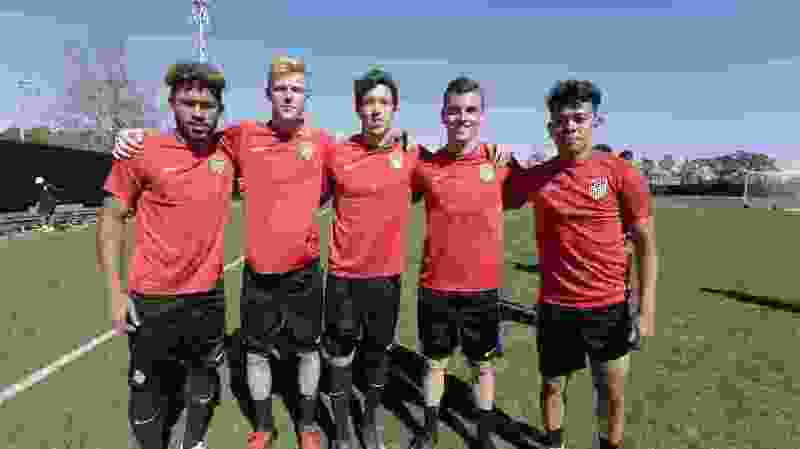 Courtesy | U.S. Soccer From left to right: RSL academy products Danilo Acosta, Justen Glad, Aaron Herrera, Brooks Lennon and Sebastian Saucedo with the U.S. U-20s at 2017 CONCACAF Championship in Costa Rica. As he stepped on to the field for his first Major League Soccer start in July, Real Salt Lake right back Aaron Herrera felt the nerves flow though him. And while he had spent the week leading up to the game making sure he was as mentally sharp as possible, it still took a while for the butterflies to float away. Even now, with almost an entire regular season under his belt, Herrera still can’t comprehend the idea that he is a professional soccer player. But the MLS rookie and homegrown player has proven he belongs in the league. He has started the last 12 games for RSL and averaged 89.2 minutes in those starts — numbers commensurate with veterans. And it’s all come as somewhat of a surprise to him. Herrera wasn’t supposed to see the field with RSL much at all this season. He expected to spend the majority of the time playing with the Monarchs. If he did get to share the field with RSL’s first team, he thought, it would only be during the occasional training session. But during the preseason, injuries to other players and the lineup shifts that followed allowed Herrera to sneak in to the list of available players. He was slated to play against FC Dallas in the season’s opener before he suffered a hamstring injury that kept him out six weeks. That did not prove too cumbersome for Herrera, who has worked his way in to beneficial situations for his entire soccer career. Growing up in Las Cruces, New Mexico, and playing for club teams as a boy, Herrera always competed with and against players a year older than he, said RSL assistant coach Freddy Juarez, who is from Las Cruces and coached a young Herrera. When it got the point where competition in his hometown was too easy for him, Herrera moved to Arizona and joined RSL’s academy. At first, however, Herrera struggled to compete at the same level as his academy teammates. Physically, he was much smaller at the time. But Herrera became a gym rat, lifting weights before and after practice. He was a frequent participant in soccer tennis. Anything Herrera could do to improve, he did. Meanwhile, Jeremy Fishbein, head coach of the University of New Mexico’s men’s soccer team, watched Herrera from afar. Fishbein saw potential in him since his days at the academy. But it wasn’t until Herrera’s final year, when he started to match and surpass his competition, that Fishbein thought he could mold Herrera into a professional. Herrera’s last year at the academy coincided with his involvement in the U.S. Soccer’s under-20 men’s national team. In 2017, he went South Korea and competed in the U-20 World Cup with Glad, Sebastian Saucedo, Brooks Lennon and Danny Acosta. That experience told Fishbein that Herrera was ready for the next level. He recruited Herrera to UNM, where he played three seasons before signing his contract with RSL. Herrera said his rookie season has gone better than he could have imagined. But it hasn’t been without its adjustments. While he is primarily a left-footed player, Herrera has been relegated to playing on the right side of the field. RSL head coach Mike Petke, who said he saw “something special” in Herrera, likes how the rookie defender has adjusted to that role. “He’s playing out of position a little bit, but he’s still taking the opportunity and running with it,” Petke said. Accepting his role is not the only way Herrera has shown his professionalism over the course of the season. He said he has picked up weightlifting and training habits from veterans like Damir Kreilach and Kyle Beckerman. About a month ago, he started going to Juarez and asking to review film so he can see what areas of his game he can improve. But in some ways, soccer still feels to Herrera like it did at UNM. Like it did when he was a skinny teenager at the RSL academy. Like it did when he was a little boy from New Mexico who once scored on a goal in the wrong net after being asked to switch teams in the middle of a U-6 practice. Kickoff » Thursday, 7 p.m.
About New England » Defender Andrew Farrell is out with a hamstring injury. … Eliminated from playoff contention over the weekend. … Has lost four of its last five road games. … Head coach Brad Friedel told his team recently that the game against RSL is basically the start of their preseason. … With a yellow card, midfielder Luis Caicedo will earn a suspension. About RSL » Will be without Kyle Beckerman and Sunday “Sunny” Stephen, both of whom will serve a one-game suspension due to yellow card accumulation. Due to international duty, Albert Rusnák, Joao Plata and Jefferson Savarino could all be out as well. … Several players said winning against the Revolution is imperative if they want to keep their playoff hopes alive. … Last loss against Portland was only RSL’s second home loss of the season. … Tied New England 0-0 in last meeting at home.